West London (1921) is a piercing setting of a Matthew Arnold poem on the effects of poverty. The music stems from Ives’s never-finished Matthew Arnold Overture, one of his series of ‘Men of Literature’ overtures (of which only the Robert Browning Overture was ever completed). 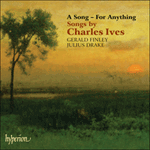 In the final bars of the song Ives quotes, off key, the hymn tune ‘There is a Fountain filled with Blood’. Across, and begg’d, and came back satisfied. The rich she had let pass with a frozen stare.